The pretty that Kate Spade gave me was joyful pretty. Girl next door pretty. Bright colors. Gold embossment that you had to search to find — not like Louis Vuitton, who, let’s face it, should pay us to carry the brand the way he makes his name scream from your arm while it’s carrying the bag. 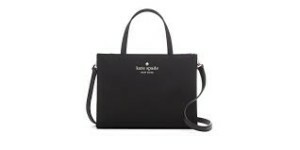 I knew I’d like Kate Spade if we crossed paths. I liked her name. The Midwestern girl in me related to that name. Kate. Not Katherine, which would have been a whole other thing, like my friend Cathe, who changed her name to Cathryn when she married a Wall Street tycoon. Kate. And, together with “Spade,” we had two syllables that made up an entire brand. It didn’t take up the space that some of the other designers do. Kate Spade. Take me as I am. Simple, but pretty. Kate was the first to really understand what I needed in a bag. Big enough, but not briefcase sized. Pockets. Easy in-and-out mechanisms. Solid colors that go with everything. Not too heavy. Not ostentatious. I haven’t bought a Kate Spade bag in years. She’s a days gone by girl in my purchasing platform. But she, and the accessories she created, was an accessory in a decade of growth for me, and I carried her with me everywhere. Comfortably. Confidently. I wish her Godspeed to wherever she is headed. And I thank her and yearn for Kate Spade days of old.